Lenco iPod dock system kicks in at £230 | What Hi-Fi? 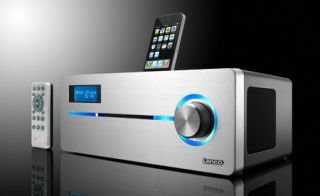 New from Swiss audio company Lenco is the £230, aluminium-clad iPD-9000 iPod dock with built-in CD player and FM radio. It incorporates Lenco's "Sonic Emotion 3D" chipset, the digital signal processing (DSP) technology that's meant help to fill the room with sound. The firm claims the system creates a "surround sound experience" from a single unit. There are two 10W side-firing speakers and a 45W rear-firing subwoofer. The iPD-9000 works with the full range of iPods and iPhones, which can be docksed on top of the unit to play and recharge. Additional features include a blue backlit LCD display, digital volume control, bass/treble controls, a sleep timer and composite video output.